Fortunately the end of October gives us some beautiful sunny days. 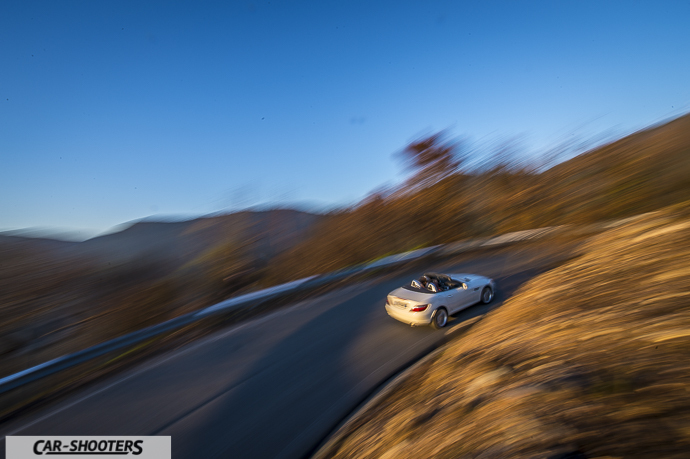 Good to test a Mercedes SLK. Clean air, warm temperatures and autumn colours looking better than ever. 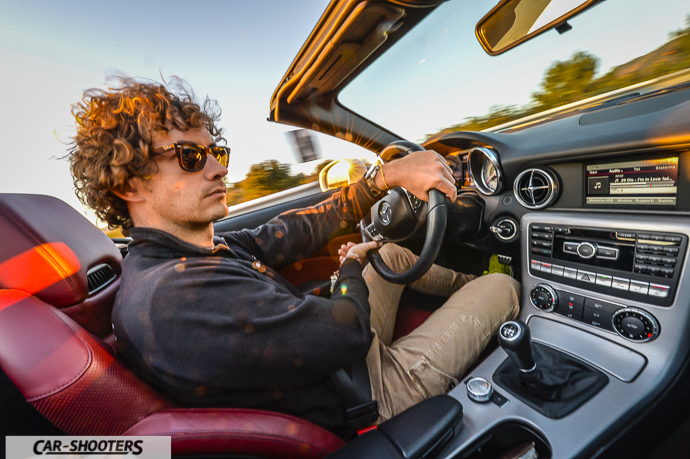 If we can add a sporty convertible everything turns into a wonderful mix of pleasures. This weekend I’m lucky to be able to add this ingredient. I am with a convertible Sports Lightweight and Compact, translated from German Sportlich, Leicht, Kompakt. 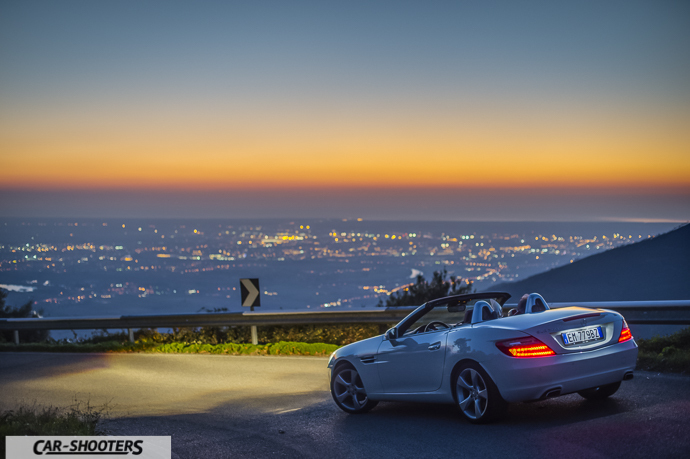 For friends only, it’s SLK. 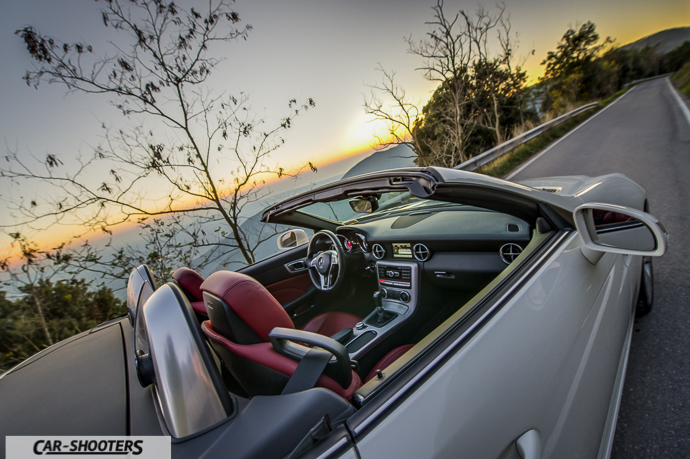 For almost 20 years, precisely since 1996, Mercedes offers this splendid sports retractable hardtop. 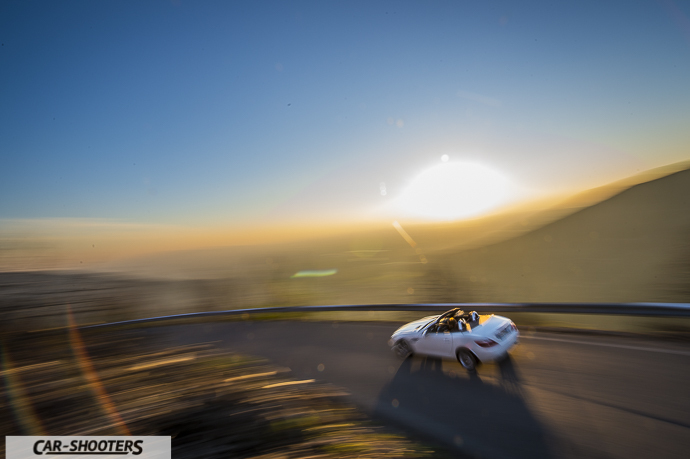 Being a convertible is definitely always been its strong point. Sure, you have to renounce to the charm of soft top but everything is paid off with a great versatility and ability to be used 365 days a year. As early as 1996 with the first series R170 appeared to be an object of desire. Aggressive, right size, driving pleasure but also a good dose of elegance, which means that customers never renounced to Mercedes. The starting point was the class C, at the time the overall quality was excellent, as well as its performances. The success continued in 2004 with the second generation R171, inspired by the SLR super car and F1, is has been confirmed as worthy heir even though in my opinion the down front, the star a bit too horizontal and smooth lines make it too graceful. A car for gentlemen, definitely a gem but without such aggressiveness that you would expect from a car like that. By the third generation, the R172, introduced in 2011, the line changes radically. The major changes relate to the front, just the part that made the previous series too placid. 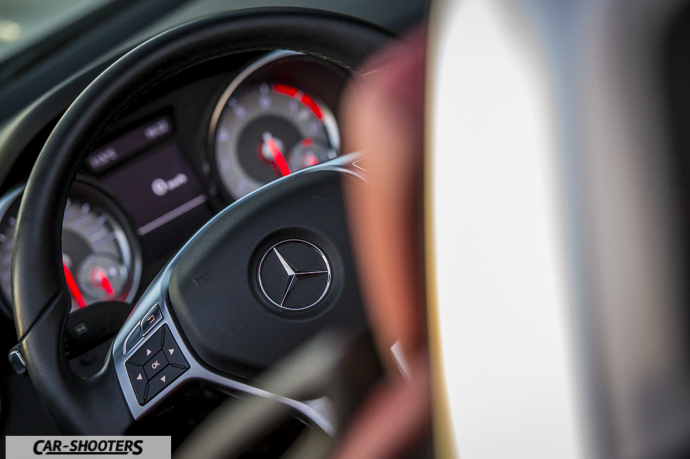 The line is taken from the fabulous SLS supercar flagship current production Mercedes. The dimensions are very compact, the overall length is just over 4 meters and the proportions are extremely successful. The cabin is set back, it sits very close to the rear wheels, the metal roof, even when closed, connects perfectly to the body. The hood looks long and impressive. No more face down, now the front opens with a calender that is set high in the beautiful large Mercedes star, as the sport of the past. 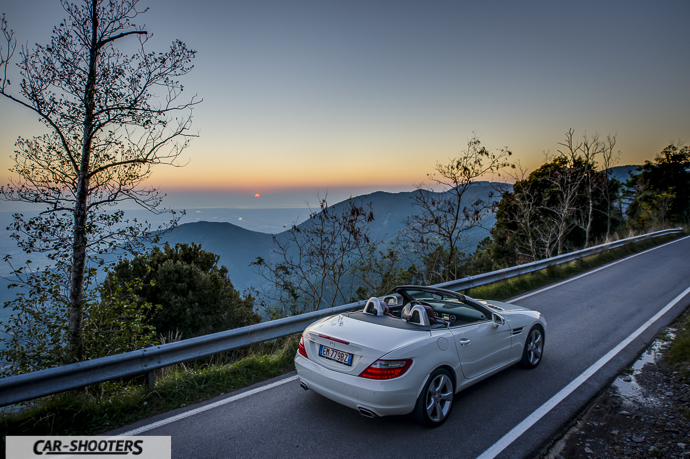 Minor adjustments that will drastically change the look, the more angular lines increase the feeling of sportsmanship, the SLK appears well-placed on the asphalt. The elegance has certainly not been lost over previous versions and the sportier eye remains definitely satisfied. A car that is good for both show up on the track and for a business appointment in suits. The car for this test drive is satisfying from the point of view of aesthetics thanks to the wheels 18 ‘and featured the beautiful red leather interior. 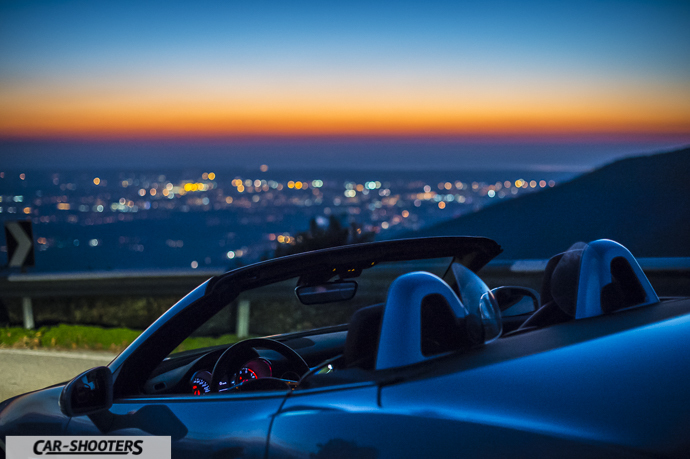 Turning around the roof open you will be amazed; configuration roadster is impossible to pass unnoticed. The harmony of the design is centred in the middle, it is never disproportionate from anywhere you look. 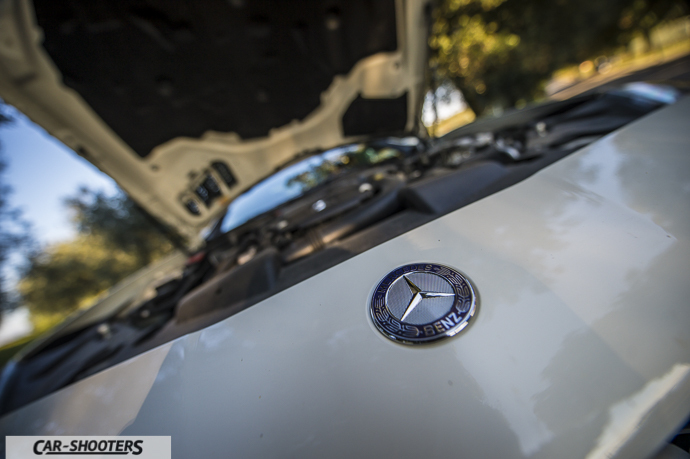 The engine hood is even longer and the passenger compartment even more backward. The latter is a small lounge in miniature. 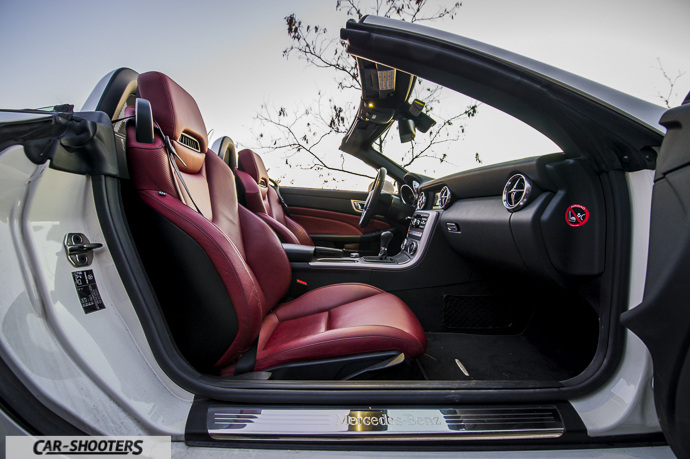 The leather seats have a beautiful shape that is also rather comfortable on long trips. The feeling of quality is very high. The controls are all in the right place and the circular air vents in aluminium, strongly inspired by those of the SLS, are impressive. The main screen could be larger, overall is still very practical thanks to the central knob. The optimum driving position they find everyone, even the highest. The steering wheel is adjustable in depth and lowering the seat is not likely to have the upper part of the windscreen too close to the front, a defect which is often found on cars of this type. The legs can be stretched and steering wheel still in place. The seat offers excellent containment, with the manual transmission is likely, however, hitting his elbow on the side panel protrudes into the transition from third to second. Before seeing how it goes, we take stock of what is the mechanics of the current model. 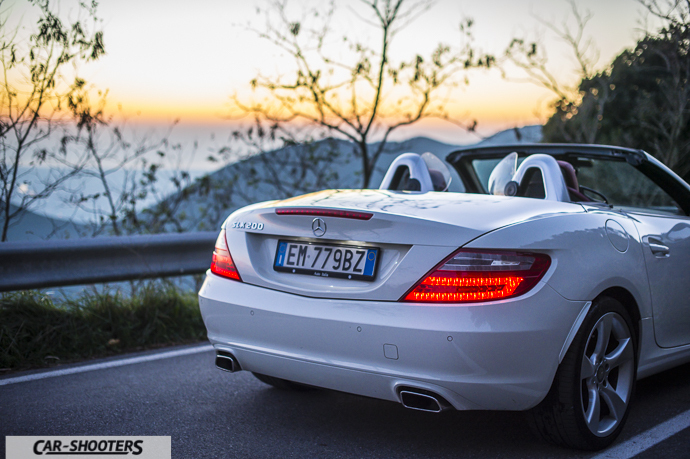 The SLK is available in four different engines, six and eight cylinders. 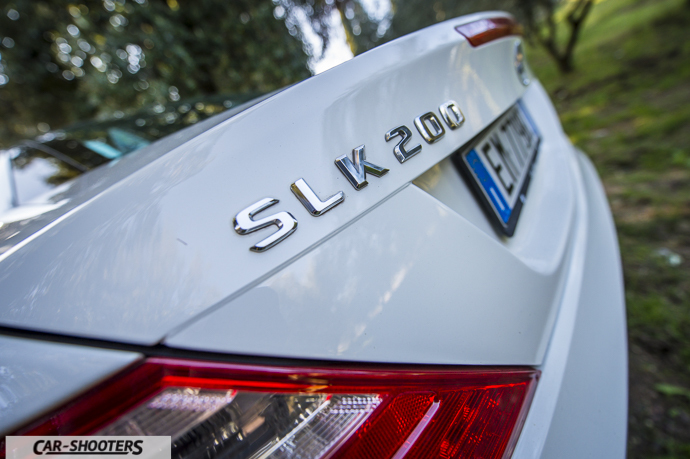 The most widespread on our market, as always, is definitely the engine 200 with 1.8 to four cylinders. The R172 is finally abandoned the supercharger to switch to the turbocharger. Farewell then to the words “Kompressor” on the side. The power is 184 horsepower at 5250 rpm while the torque is 270 Nm at 1700 rev. The platform used is closely related to that of his contemporary class C. The suspensions have a multilink on both axes. The transmission is a six-speed manual, optional available the modern automatic 7G-TRONIC seven. In my opinion on a car of this type the manual is the right choice, but unfortunately the engine becomes higher than the automatic choice. The engine is running, open the roof. To open there is a button, it opens a mini crisper bin next to the armrest where it has a lever for opening and closing. Too bad you can not do it on the move, the car must be stationary. The opening time, however, is rather fast, slower definitely of a canvas but faster than many other metal. 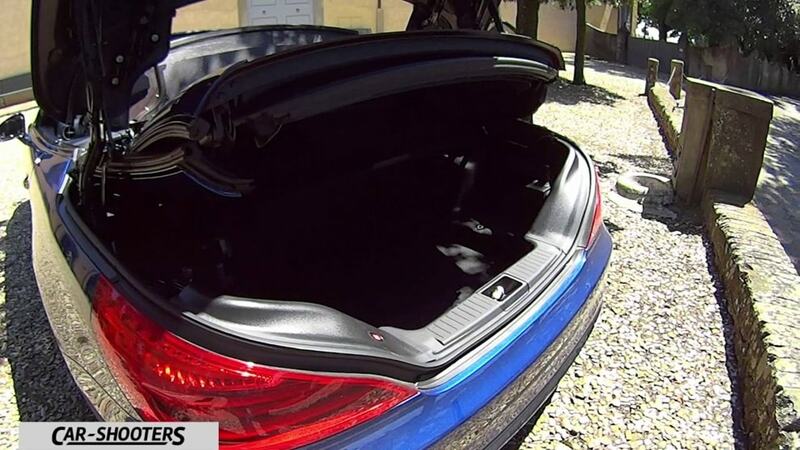 The roof folds in the trunk which obviously remains sacrificed from the point of view of load capacity. The luggage of two people for a weekend out can still be placed in the open configuration. 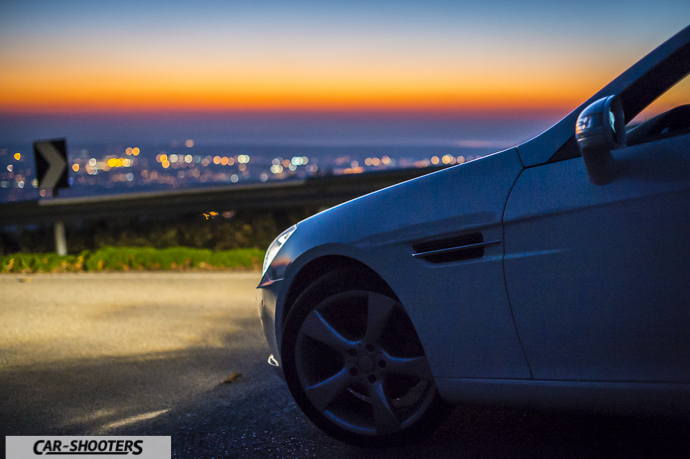 Start a beautiful course on a hilly road, great for enjoying the SLK. Going for a walk is really appreciates the absence of vortices annoying in the cockpit, the test sample is equipped with AIRSCARF, a scarf of air that consists of a nozzle behind the neck that emits hot air. Combining this essential accessory to the windbreak you can travel with the roof open at all outdoor temperatures. Walking in the hills is a real pleasure, shame that the engine is mushy as it should and that you may warn a vertical drop of power a little too marked at around 2000 rpm. A six-cylinder engine of the same capacity would be more appropriate but would definitely outdated considering the current trend of downsizing. 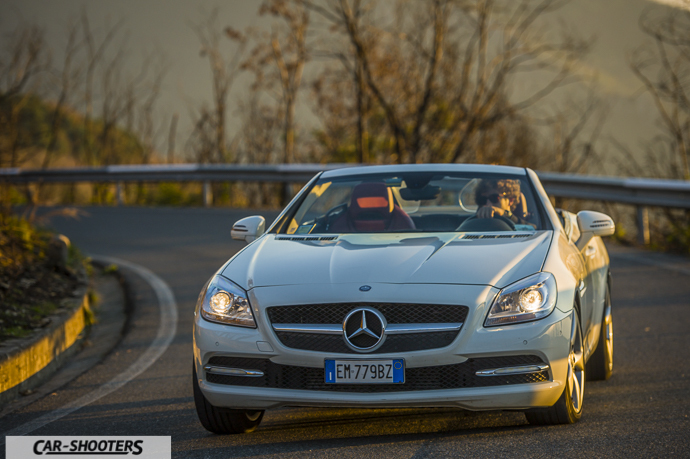 It resists little to these speeds, you want to have fun and the SLK does not disappoint this request. Accelerating the sound from the two drains is exciting, top engine has a good progression, the changed optimum is around 6000 rpm, not many, but needless to push harder. 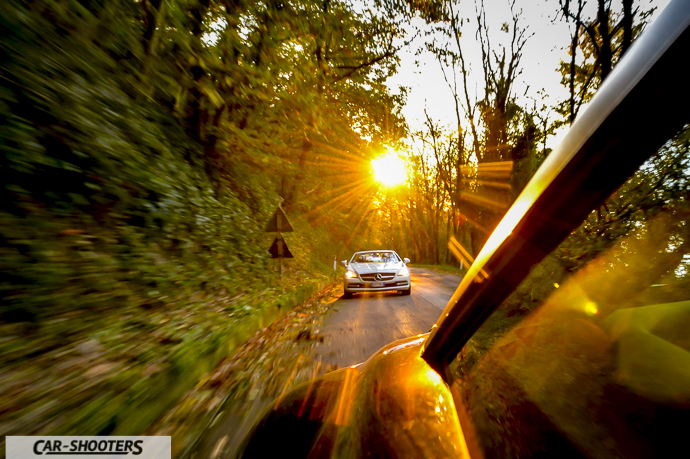 Even with the controls switched off it is never too busy, but the behaviour is easily controllable oversteer. The curves you travel at very high speeds and security. Although the structure is not rigid to facilitate daily use body roll is contained. The steering is very precise, almost never come off your hands by 9:15, especially is very communicative thanks to the hydraulic power steering system. 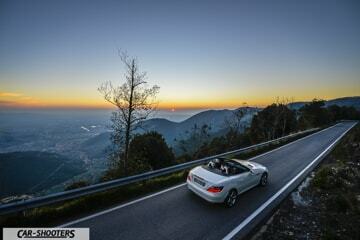 Much of the pleasure comes from contact with the road that the SLK is able to convey. The manual transmission adds even more fun. The reports are quite long and climbing, especially if it is strong. The braking system is slightly below tone than the rest of the mechanics. Braking distances are contained but the pedal is not that feeling of sportsmanship that should, above all, the race is too long. 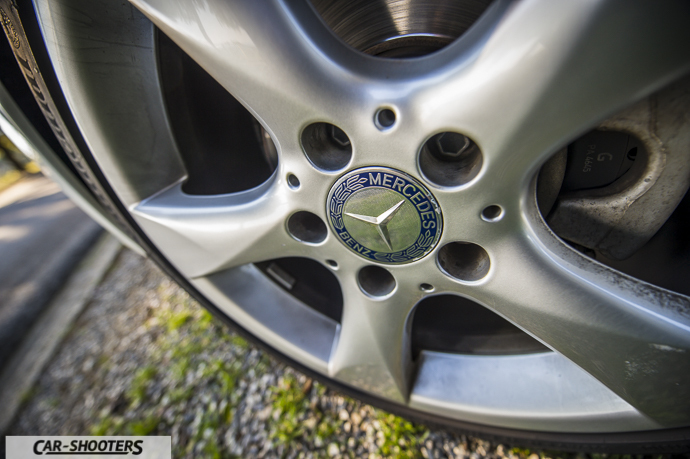 Detail easily remedied because as an option a bigger brakes; if you use your car in order to complete the sporty driving pleasure it is certainly recommended. In the city proves to be very practical, it must of course be willing to do some extra effort to get on and off. 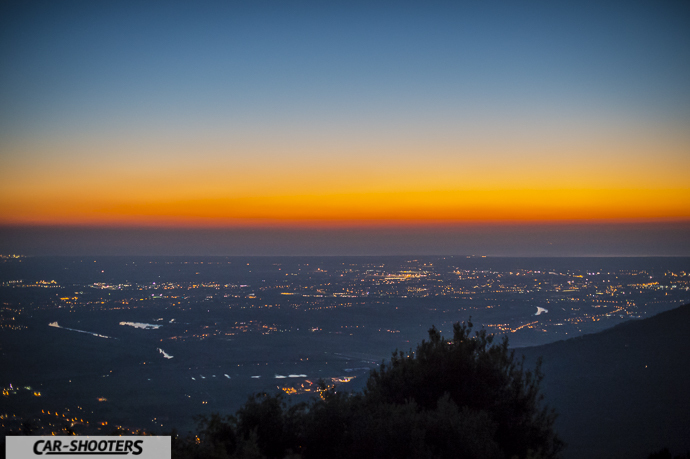 The roughness of the terrain are well filtered, the cobbles does not transmit vibrations which cause discomfort. Thanks to its small size you park well, the turning radius is sufficiently low. I found it also great to deal with a trip highway at speeds of code thanks to metal roof traveling well insulated from noise and hiss. 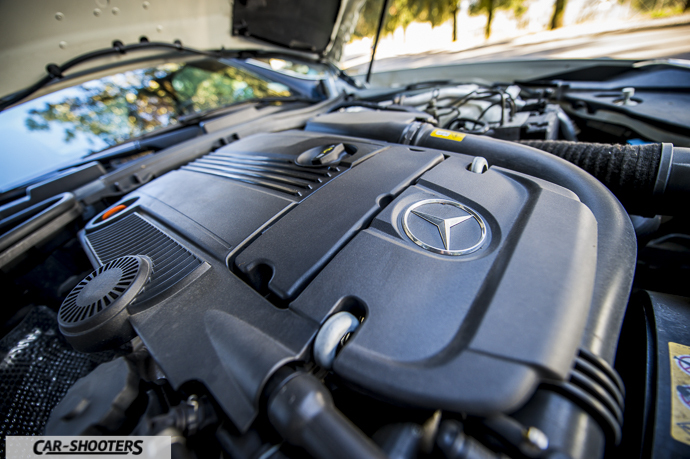 The engine is never invasive thanks to a sixth of rest rather long. Consumption? Given the performance definitely content! Of course if you decide to push more deeply are 184 horses “feed”. On country roads it is however difficult to even 14 km / l. In conclusion we can certainly be satisfied of the great versatility it offers. The only limit are the two bucket seats, for the rest is an automobile suitable for any condition, distance and type of the route. Those looking for a car for two, sport, full of charm and suitable for everyday use with her, they will made is definitely the right choice.